29. Du Cleuziou, Henri (1833-1896). 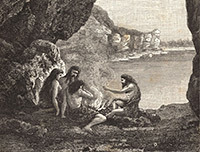 La creation de l'homme et les premiers ages de humanite. Paris: Marpon and Flammarion, 1887. 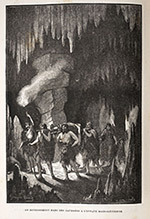 Not much is known about Henri Du Cleuziou, but his book of 1887 contains a variety of provocative images about early humans, drawn by at least half-a-dozen different artists. The most intriguing is this one, by an artist whose signature is only partially legible. 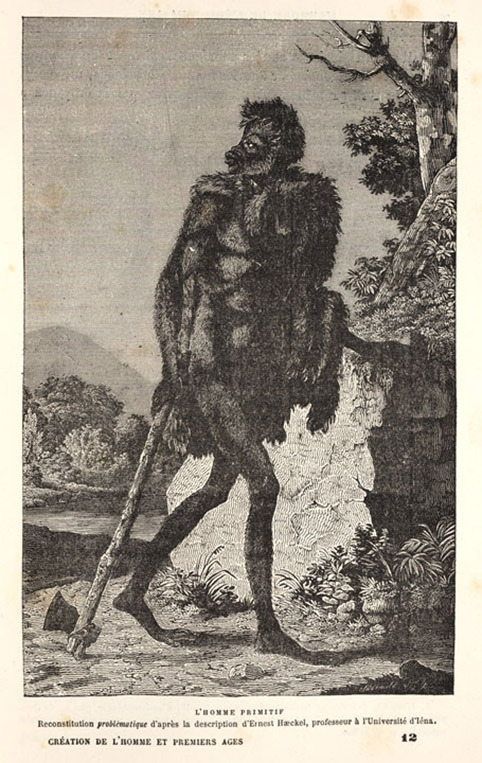 What makes it interesting is the caption, which says this is a primitive man as described by Ernest Haeckelin his book on human origins. This then would be an attempt to reconstruct Pithecanthropus, Haeckel’s conjectured ape-man, the ancestor of modern humans. As the author admits, the reconstruction is problematique. 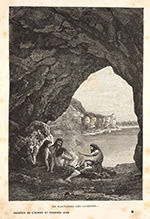 Another wood engraving makes a significant contribution to the rapidly growing iconography of the cave bear fight. 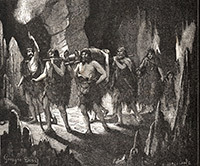 This one is of interest because the evidence that permits such a reconstruction—the bones of a cave bear and a Neanderthal—are prominently displayed on the floor of the cave beneath the combatants.